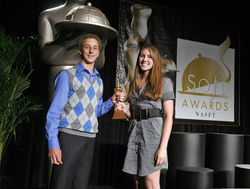 High school entrepreneurs win the gourmet food industry's highest honor. At just 16 and 17 years old, Brandini Toffee founders Leah Post and Brandon "Brandini" Weimer are the youngest entrepreneurs to receive the coveted Gold sofi™ Award. The duo won for Outstanding Chocolate for their gourmet toffee. The award is from the National Association for the Specialty Food Trade, a non-profit trade association established in 1952. "I can't believe we actually won!" says Brandon Weimer of Brandini Toffee. Brandon and Leah were presented with their award, a gold chef statue, by noted chef Jacques Pépin at a special ceremony during the 54th Summer Fancy Food Show in New York City. This year's contest was the most competitive yet, with a record 2,191 entries across 32 categories. The field was narrowed to 150 Silver Finalists by a panel of specialty food experts last spring. The gold winners were then selected by more than 250 retailers and restaurant buyers in a judging event at the Fancy Food Show, which is owned and operated by the NASFT. "sofi" stands for specialty outstanding food innovation. Companies must be a member of the trade group to enter a product for an award. Leah and Brandon started the business to help finance a class trip to Italy their sophomore year of high school. Challenged by their parents to raise half the money, they went to work refining a recipe Brandon had been making for family and friends. They replaced milk chocolate for rich, dark chocolate, and roasted their own almonds. The final contribution to the recipe was from Don Calendar of Marie Calendar's fame after trying an early version. "This is what took our toffee to the next level", explains Leah Post, "but we can't tell you what that is". Within six weeks Brandon and Leah sold enough toffee to family, friends and their community to pay for their tickets and spending money. In the spring of 2007, they visited Rome, Florence, Assisi and Pisa. Their unexpected success prompted them to enlist their parents to help build the company. The two families contribute to the business. Leah's father designs the packaging and manages the website. Her mother is in charge of public relations and oversees events. Brandon's father manages sales and production. His mother is in charge of shipping, accounting and staffing. The toffee kids, as they have come to be known, are a local success story in the Palm Springs area, and are becoming known throughout Southern California. They have appeared in numerous stories in magazines and newspapers and on radio and television. In February, 2008, they appeared on the Martha Stewart Show. This summer they are making appearances in Costco stores in Los Angeles and Orange County, on a traveling Brandini Toffee road show. "Brandini Toffee is a great up-and-coming company and we look forward to helping them grow their business," says Wendy Weldon, L.A. Regional Candy Buyer for Costco. Brandini Toffee sells handmade almond toffee for retail, wholesale, corporate gifts, gift baskets and online. Visit the Brandini Toffee website for their complete product line including private label gifts and testimonials from around the world. See pictures from their trip to Italy and read stories about their adventures in starting a new business. For additional information on Brandini Toffee, contact Maggie Post or visit http://www.brandinitoffee.com. Brandini Toffee is a registered trademark. Leah Post and Brandon Weimer are Seniors at La Quinta High School. They both hold a 4.0+ GPA and are certified scuba divers. Brandon is a member of the debate team and Leah is a varsity swimmer. The two have been friends since the age of 4 and look forward to the possibility of attending University together in 2009. Located in La Quinta, California Brandini Toffee was founded October 1st, 2006.